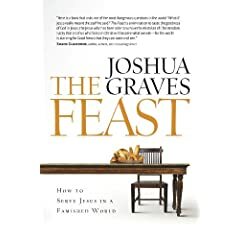 Josh Graves wrote a great book that ushers in a new age of young writers who don’t deconstruct the church and the Bible as much as help us imagine a new world of the kingdom of God. Josh asks, What would happen if we truly eat and digest the stories of the Bible, the teachings of Jesus and events of his life? What he brings to the table is not only a way of feasting on the word but also serving Christ in the world. He tells lots of personal stories that make the biblical stories come alive in Josh and other subjects of his stories. Another thing Josh does really well both in this book and in his life and teaching is to bring in contemporary or historical activists who have eaten Scripture themselves and faithfully lived out the calling of God. Here is one of my favorite sections of the book, and Josh here calls for renewed imagination and engagement in Scripture, particularly in spiritually anorexic cultures like America today. Imagination, in its fullest sense, should enlarge, enliven, and transform—all of us. We face a crisis, in part, because Christians today have lost the ability to imagine the world any differently than it is. When I was young, I spent hours each day in the driveway playing basketball with my twin brother. We had crazy wonderful imaginations. We imagined ourselves already as heroes and superstars. We saw ourselves as more than thirteen-year-olds with pimples and changing voices. When we’re young, we’re told to trust our imaginations. We’re encouraged to explore and expand our imaginations, even if that means we end up on the moon! “The sky’s the limit,” they tell us. Until they introduce the all-too-real theory of gravity. Something happens to us as we grow older. We begin to believe that we can’t trust our imaginations after all. We’re told that certain figures in our early childhood—Santa, our imaginary friends—aren’t in fact real. We’re told that responsible boys and girls don’t practice their jump-shots into the wee hours of the night. Responsible boys and girls memorize algebraic equations and French predicates. The feast of which you are about to partake dares you to see the world with fresh eyes. Just as Jesus’ friends on the road to Emmaus recognized him in the “breaking of the bread” following Easter Sunday, we home come into Christ’s presence when this food is broken, offered, and consumed. Knowing that Christ is here, let’s open our eyes. Christianity in the West is malnourished—in need of a feast. I am part of the problem. You are part of the problem. We, together, are invited to a table to hear and digest the stories of our faith once again. This time, reading not to defend our previously held doctrines, but reading with humility and faith that God is doing a new thing among us. Reading to help us become part of God’s movement. When we feast upon the stories and life of Jesus, we are able to walk to a different cadence, for the childhood maxim of our mothers is correct: we are what we eat. When we eat and digest the words of Jesus, we will find ourselves energized to appreciate, engage, and serve God’s world. Taste and see that the Lord is good, that God is moving and working in our world today. In what ways do people have to put up with me at Thanksgiving? A family therapist called in to the Diane Rehm show this morning and said when his church has done pre-Thanksgiving seminars to help people deal with tensions, these are some of the most attended classes! Rehm asked him to give some suggestions for family relationships at Thanksgiving. He said the key is putting aside differences for the 24 hours or so family gathers and value the family as a whole. I would add the following suggestion. Ask yourself, “In what ways do people have to ‘put up with’ ME during the holidays?” What if you listed a few of those things on an index card and put the card in your pocket for your gathering? On the other side of the card, you could list positive qualities of family members and add them discretely during the day. I’m going to try these two exercises this Thanksgiving, and see if I become a brighter and more thankful presence where we are. One problem comes when someone thinks he or she is not part of the family problem or dynamic. Along with putting aside differences, we ought to realize that we are each part of the family dynamic. So, what are you doing to address the problem about which you are complaining? You may not be instigating a problem, but your response or lack of one IS part of the dynamic. Take a deep breath, drink in the atmosphere of family, food, fellowship, and tell people around you that you’re thankful for them, quirky as they (and you!) are. We don’t chose our families, but we chose the way we respond to family. Thanks to all the children at Briarglen Elementary of Union Schools and to Tamra Bird, principal, who led a “Bedlam” Canned Food Drive. Vice Principal, Tara Schiffelbein, is an OSU grad and Tamra an OU grad! Briarglen kids put their canned goods on one of two tables: OSU or OU. OSU won. We’ll see what happens this Saturday in the Bedlam football game. The cans will be distributed to struggling families in the next few weeks during the holidays. Thanks again to the Briarglen families and children who donated cans to help those who are struggling with hunger in East Tulsa. Would you go to an inter-faith dialogue? Traditions you’ve long known, or in God? Would you go to an inter-faith dialogue where a Jewish woman is the teacher? Where would you be on the scale, 1-10? 1 is you see no reason and even think it’s wrong to dialogue with people outside the Christian faith. 3 is that it’s intimidating or stress-inducing even thinking about it. 5 is you are indifferent and you’ve never done it. 7 is that you’d consider it and would very interested. 10 would be you are currently involved or have been to inter-faith dialogues and appreciate them. The speaker at an inter-faith dialogue this week at Temple Israel in Tulsa was Dr. Dvora Weisberg. She began the first session with a story about rooming in college with a Catholic who after a month rooming together asked, “Why did you kill Jesus?” She tried to interact with her roommate in many conversations about who killed Jesus, the Jews, Romans, us. She said Jews view the crucifixion of Christ as a historical event. Christians view it as historical and theological in the same way Jews view the Exodus and the parting of the Red Sea as historical and theological. Because of these conversations in college, Dr. Weisberg said she avoided inter-faith dialogue, until she was asked to teach a course on Early Christian Origins. She read the New Testament and examined texts and gained a deep appreciation for the Christian faith. She then illustrated several key points about how we can learn from one another by mutually respecting one another and being confident in our own beliefs but not overconfident. As Randy Harris said in his book, God Work, before we seek to convert someone from another faith, consider the kind of conversation you would have to have with your family if you were to become Jewish or Muslim or any other faith besides Christian. That’s the conversation you are asking someone else to have to convert to Christianity. That doesn’t lead us to not evangelize but it gives us a Golden Rule approach to sharing our faith in Christ. Inter-faith dialogue is enriching because we come to understand not only the other’s faith better, but we come back to our own faith with more wisdom and understanding. Friendspeak is FEW. Friendship + English + Word. People in the United States today need English conversation skills. Friendspeak uses the Gospel of Luke and other Bible books to practice English conversation between workers and readers who come in for weekly meetings one on one. Mark Woodward from Friendspeak spent the weekend with us at Garnett, equipping us in a seminar for workers in an exciting new ministry for our church. At Garnett we plan to launch Friendspeak early in 2010 by promoting the program with existing networks at Garnett and the Green Country Event Center, such as the Hmong American Association and Union School District GED program. What does a lazy legalist do everyday? Holly W. was baptized on her 30th birthday. She said her twenties were pretty rough and she wanted to start her thirties right. I told her baptism is new life and the most amazing way to plunge into a relationship with Jesus by enacting what he did for us in his death on the cross and his glorious resurrection. And I told her she is really–truly–forgiven, washed and made new. We are the bride of Christ, and this is our wedding ceremony. 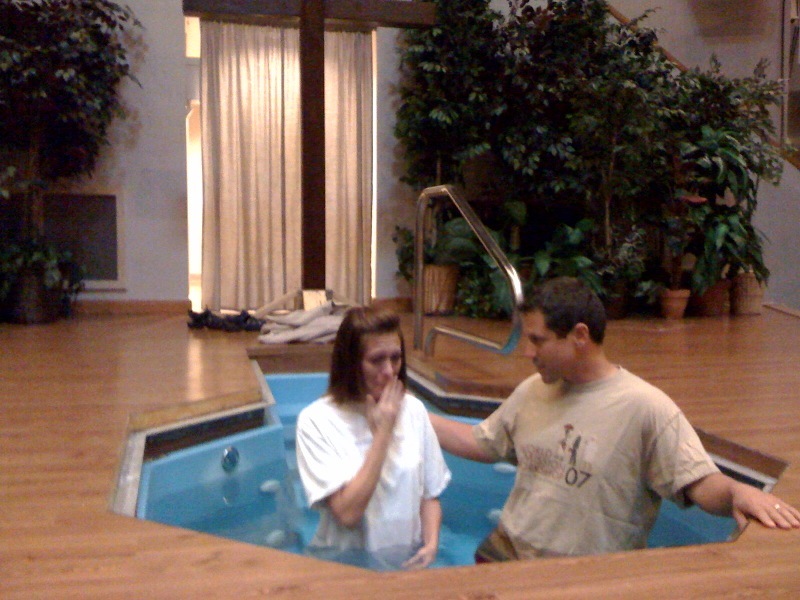 Holly W. was baptized recently at Garnett. Melissa Gilbert visited the Habitat house Garnett and several other churches are helping to build. The Tulsa World story is about the house and the family building next door. The house in the background behind Gilbert is the “Apostles Build” that Garnett is participating in. Don’t forget to head out there any Saturday morning to help. Would you protest a group home in your neighborhood? You live in a neighborhood and a group home is planned for one of the houses down the street. The “recovery house” is run by a Christian group helping eight recovering addicts from drug and alcohol abuse. You have children. Are you concerned for their safety? Are you worried about your property values? Nearly 100 people met at a local library in Tulsa to protest such a house. Two of their concerns were children safety and property values. No one denied the right of people to have a second chance . . . just not in my neighborhood, some said. Is there an irony here that of 100 people attending such a meeting, a good percentage of those people are addicted to something lethal, threatening the well-being of the neighborhood, but they just haven’t admitted it yet? Seems those recovering admit what they’re dealing with and are on a narrow path to recovery. The Rock and the Rabbi is an acoustic concert story about the friendship of Peter and Jesus. I saw it at the PAC in Tulsa a few years ago and it stirred my soul in a way few other productions ever have. Tonight, Garnett Church’s Green Country Event Center, November 9, 2009 @ 7:30 pm. The Witnesses is the continuing story of the life of the early disciples and premieres in Tulsa Tuesday night, November 10, 2009 @ 7:30 at Garnett. Tickets are Tickets are $20 and available here or you can buy them at the door. Call 918 663 3000 for more info. 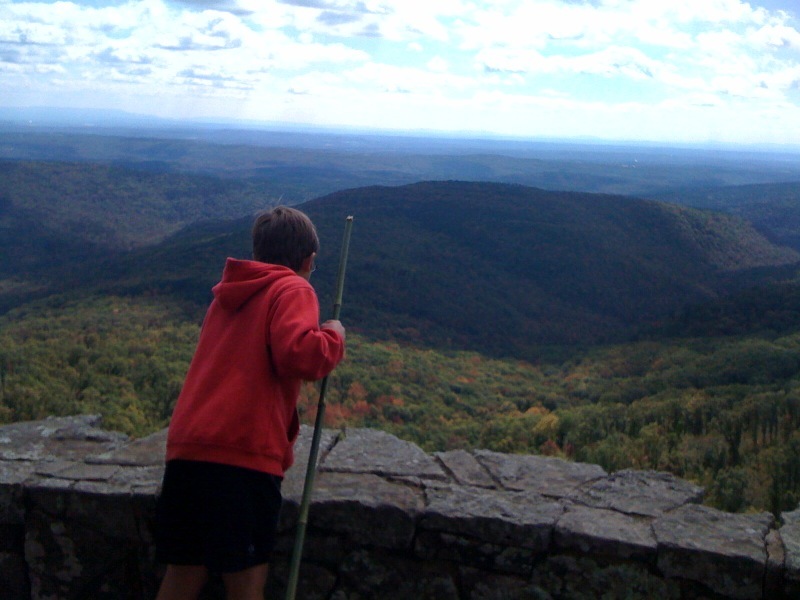 Went camping with a long-time tradition at Garnett, a father-son camp out. I appreciate Brad Haltom for taking this on the last few years and really taking it to the next level with how he’s planned and promoted it and encouraged boys to become men and men to get out and act like boys (within limits!). We drilled on the front lawn of Garnett to raise awareness about the 1.2 billion people worldwide who have no clean water to drink today. Bobby and Candice Garner, missionaries in Uganda, visited us and helped drill. 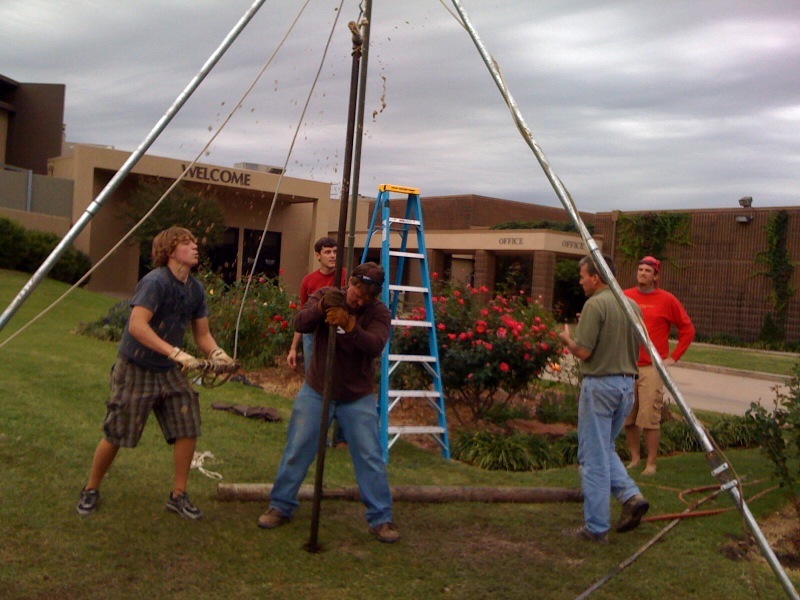 They helped us raise money at Garnett to buy a water well drilling kit from http://www.water4.org. The Rock and The Rabbi comes to Garnett November 9 with an premiere performance of The Witnesses, November 10. Oklahoma Christian University and The Green Country Event Center are sponsoring and hosting this event. Watch this scene. Will you join the Restoration? I have made two decisions . . .
1. I love the Churches of Christ family and plan to stay as long as the family doesn’t vote me off the island. 2. God loves people of all nations, and Christ still deeply desires the unity he prayed for, and I want to be part of that unity with all who follow Jesus. These two decisions bring a healthy tension in my life. And if you take these two decisions seriously, you too will feel a deeper tension. This tension is similar to the way you feel when you love your family but also have compassion for the outcast. You take risks, you do not abandon your first loves, but you also do not abandon a suffering person to injustice or hopelessness. Today and in this article the call is for Churches of Christ to follow the leading of the Holy Spirit to be set free from the idea that we can master the Bible and all truth. Rather, we must let the Bible and the Spirit of Truth master us. The question is not, “When will people join us?” but a bigger question: “When will we join the 21st Century Restoration and Revival that’s happening worldwide?” God’s Spirit is moving and incredible and passionate and I want to be part of what’s God is doing among people of all nations, tribes, and denominations.